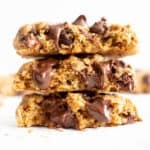 Best Gluten Free Oatmeal Chocolate Chip Cookies Recipe (GF, Vegan, Dairy-Free): this easy vegan oatmeal chocolate chip cookies recipe has a crispy exterior, soft & chewy interior, with cozy oatmeal flavor. It’s the best GF oatmeal chocolate chip cookies – gluten free, dairy-free and made with healthy ingredients! Vegan, Gluten Free, Dairy Free. These best vegan oatmeal chocolate chip cookies are crispy on the outside, just the perfect amount of chewy and soft on the inside, packed full of oatmeal & chocolate flavor, with just a hint of the perfect warm spices to highlight the cozy oatmeal chocolate chip comfort you’ve been searching for. 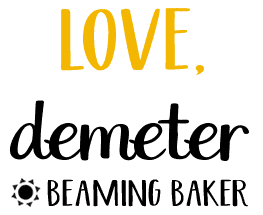 If you’ve been around Beaming Baker for a while, you know that I have a deep, deep passion for gluten free vegan chocolate chip cookies. 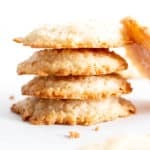 And after I changed my foolhardy outlook on all things oatmeal cookies, I realized that my passion (and yours, woohoo!!) extended ever so deeply for gluten free vegan oatmeal cookies, too. 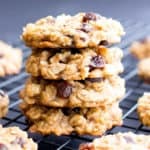 In fact… some of my most popular recipes are oatmeal cookies: easy gluten free vegan oatmeal raisin cookies, chewy healthy oatmeal chocolate chip cookies, gluten free double chocolate chip oatmeal cookies. So it was only natural that after 3+ years of working on vegan gluten free (oatmeal) cookies, I finally, finally bit the bullet and went FOR IT: the best gluten free oatmeal chocolate chip cookies recipe. Ever. Yes, even better than my super popular gluten free vegan oatmeal chocolate chip cookies. Not to worry, we’re still gonna keep it healthy… we’re gonna keep it vegan & gluten free… and we’re still gonna use whole ingredients. But we’re also gonna go a lil’ more indulgent, a lil’ saucier, and have a lil’ more fun with these oatmeal chocolate chip cookies! Are you ready? Let’s bake this! 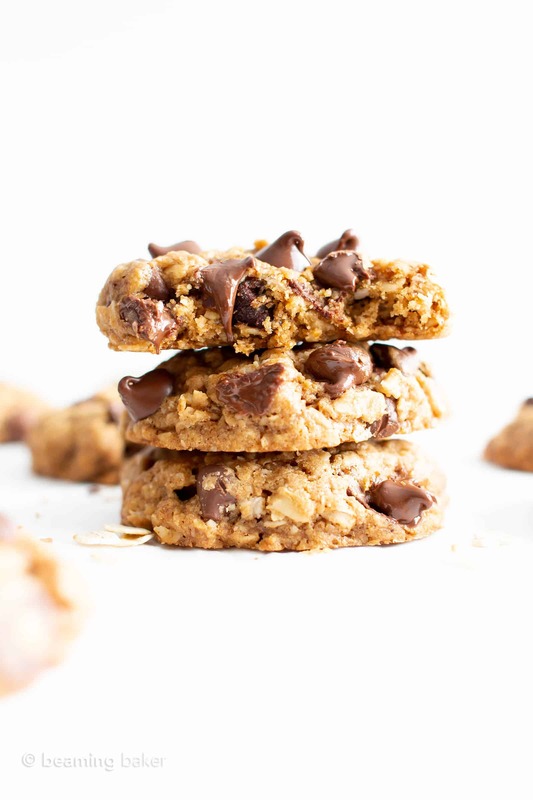 Check out the post below to find the answers to your common questions and more about this best gluten free oatmeal chocolate chip cookies recipe! 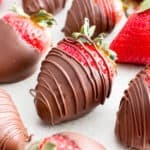 Use your favorite dairy-free chocolate chips: don’t worry about what other people think—focus on what you like, whether it’s the cheapest chocolate chips, or the hardest to find fancy vegan chocolate chips. Use your fave & they’ll shine like a diamond (hehe) in your soon-to-be-favorite vegan oatmeal chocolate chip cookies recipe! Don’t skip chilling the dough: you know I almost never ask you to chill the cookie dough (because: it’s fussy!). So when I ask, you know that it’s important. This ensures that the gf oatmeal cookie dough stays perfectly firm (aka: won’t spread like a mofo) when baked—it also enhances the flavor of the oatmeal chocolate chip cookies! Use super fine gluten free oat flour: when making your own homemade oat flour, make sure it’s super-fine aka free of coarse bits of oats. 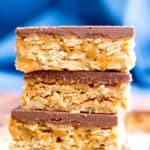 Use GF rolled oats or “old-fashioned” oats, not QUICK oats: quick or 1-minute oats are less thick, less chewy, and generally work differently in recipes that call for rolled oats. Use a cookie scoop: for uniform size and perfectly packed balls of gf oatmeal cookie dough. If you don’t like the flavor of coconut at all: try using refined coconut oil. It’s flavorless. 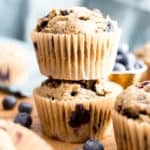 Gluten Free Oat Flour: swap with gluten free all purpose flour. Do not substitute with coconut flour, almond flour, cassava flour, etc. Those flours will work very differently in this recipe. I do not recommend it. Coconut Oil: swap with melted vegan butter or flavorless cooking oil. Coconut Sugar: swap with organic brown sugar or cane sugar. Flax Egg: swap with a chia egg or regular eggs (if not vegan). Here’s a recipe for flax eggs, in case you’re not familiar. Maple Syrup: try another liquid sweetener with the same amount of sweetness. Note: The more ingredients you change in a recipe, the less likely you’ll get ideal results. Proceed with caution, have fun experimenting & enjoy! Store your vegan gluten free oatmeal chocolate chip cookies in an airtight container at room temperature, out of direct sunlight, away from heat sources. Store gf cookies for up to 2 weeks. 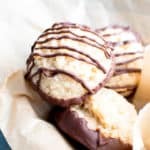 Can I Freeze this Best Vegan Oatmeal Chocolate Chip Cookies Recipe? 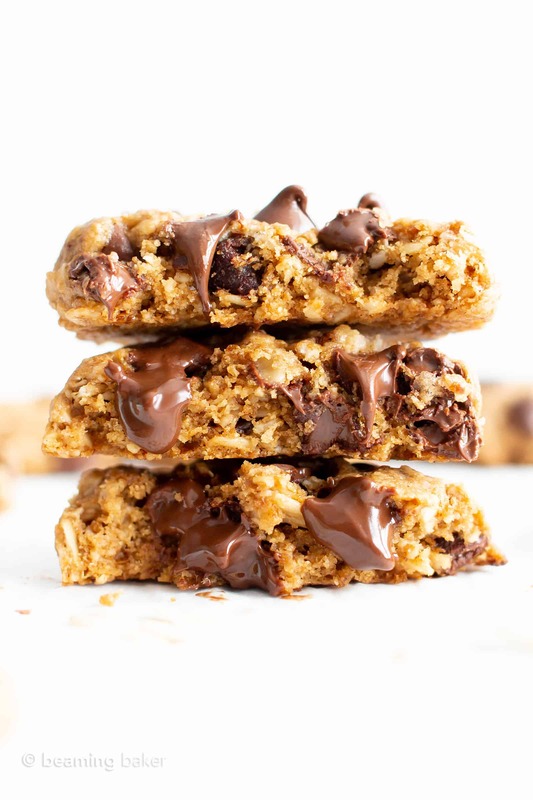 Yes, you can freeze these easy GF oatmeal chocolate chip cookies! After baking & cooling completely, store dairy-free cookies in a freezer-friendly bag or container. To enjoy the frozen vegan oatmeal chocolate chip cookies: allow to thaw for 30 minutes at room temperature, or heat in the microwave for 5-10 seconds. 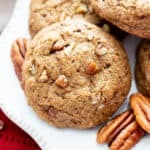 Best Gluten Free Oatmeal Chocolate Chip Cookies Recipe (GF, Vegan, Dairy-Free): this easy vegan oatmeal chocolate chip cookies recipe has a crispy exterior, soft & chewy interior, with cozy oatmeal flavor. It’s the best GF oatmeal chocolate chip cookies – gluten free, dairy-free and made with healthy ingredients! Refined Sugar-Free. In a medium bowl, whisk together all the dry ingredients. Set aside. In a large bowl, whisk together all the wet ingredients. Whisk until well-mixed. Add the dry mixture to the wet mixture. Whisk as long as you can. Switch to stirring and folding with a rubber spatula until no flour patches remain. Fold in chocolate chips. Cover bowl and chill in the freezer for about 20 minutes, until firm throughout. If necessary, allow to thaw at room temperature just until it’s soft enough to scoop, but still very firm and chilled. Using a medium cookie scoop, scoop and drop cookie dough balls onto the prepared cookie sheet, evenly spaced apart. Cookies will spread a bit. 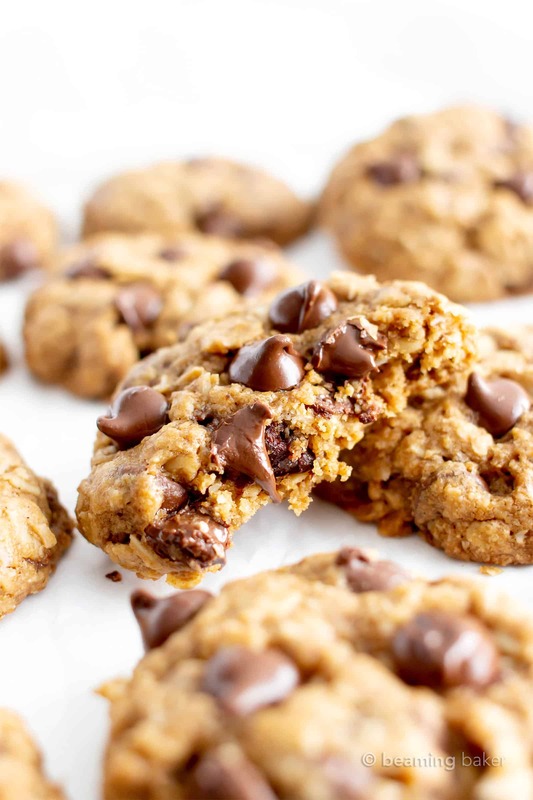 Optionally, press chocolate chips into cookies—this will help decrease sticking when flattening the cookies. Using a spoon, flatten the cookies about half way for thick cookies. Flatten considerably for just slightly thick cookies. The dough will be a bit sticky. Bake for 12-16 minutes. Mine took 14 minutes. Allow cookies to cool on the cookie sheet for about 10 minutes (on a cooling rack). Using a heatproof spatula, lift cookies off the sheet and transfer directly onto a cooling rack to cool completely before storing. Storing instructions below. Enjoy! 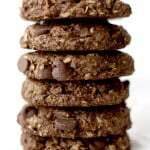 Try my Vegan Chocolate Chip Cookies and my Chewy Healthy Oatmeal Chocolate Chip Cookies! - Store in an airtight container at room temperature for 1-2 weeks. - Freezing Instructions: store in a freezer-friendly container or bag. Keep for up to 1-3 months. Thaw at room temperature for about 10-20 minutes before enjoying. Or, warm in the microwave for about 5-10 seconds. - Nutrition Information: is an estimate based on the best-selling, most common brands per ingredient. Also, it's estimated based on 27 servings per recipe, without the optional 2-3 tablespoon chocolate chip topping. 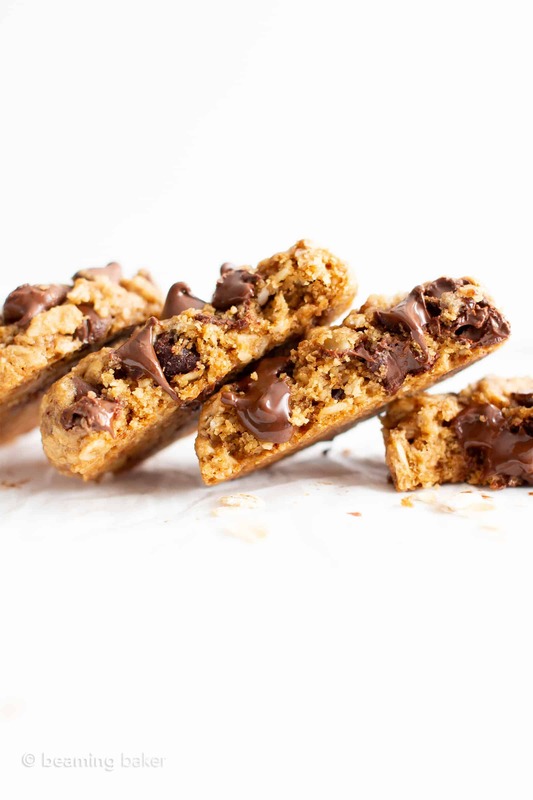 Click the links below to check out my favorite tools & ingredients used to make this easy gf oatmeal chocolate chip cookies recipe. Vegan Chocolate Chips – allergy-friendly chocolate chips, for the win! Gluten Free Oat Flour – one of my favorite vegan gluten free baking essentials. Homemade GF Oat Flour – my favorite recipe for homemade oat flour. Coconut Oil – a staple in my gluten free vegan baking kitchen! Haha thank you Susan! 😊 So glad you enjoy them! You never fail to amaze me with your indulgent looking but totally healthy desserts and sweets! I could eat a whole batch of these gorgeous oatmeal cookies! My kids to enjoy these delicious looking cookies. I love it too and have to try it out. These look so yummy and simple! Great gluten free recipe! Woohoo!!!! I was right in guessing, lol. 🙂 They look so yummy. Yeah you were!!! GREAT guess!! Hope you love them! These look seriously amazing! That melting chocolate! My son is GF and I know he will be over the moon to try these. Yay! So happy to hear you enjoy them Maria! 😊 Thank you for taking the time to share these kind words with me. It means a lot! Yes! Love that these are GF! I’d love to have a few of these right now! They look so delicious! Just call me the cookie monster now I’ve got my hands on this recipe!! Love them! I followed the recipe exactly and they turned out perfect! This recipe is a keeper! 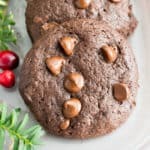 Always looking for a good GF cookie recipe! Found this one and I can’t wait to give them a try. Excellent! Hope you enjoy them Jacquelyn! I want a dozen right now! I am so drooling over these! I always love seeing what healthy desserts you come up with it, these look amazing!! These will disappear in minutes at my house!